The Case Ducks Unlimited Trapper with green smooth bone scales is a great addition to your collection or pocket. 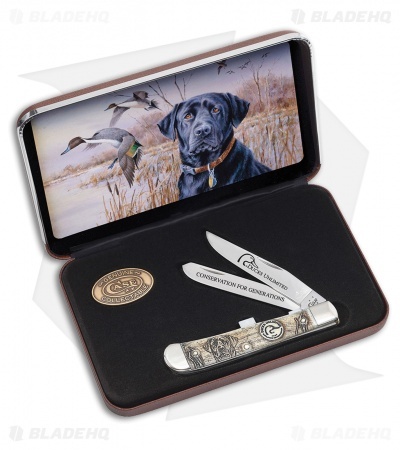 A portion of the proceeds from each knife is used for the preservation and restoration of American wetlands. Tru-Sharp surgical stainless steel clip point and spey blades provide plenty of versatility for your daily cutting tasks. Smooth green bone scales are a dark green hue with laser engraved Ducks Unlimited logo and Black Lab. Polished nickel silver bolsters with brass pinned construction ensures years of reliable use.